And on the third day, packs of 2012 Topps finally showed up at my local Target. On Tuesday and Wednesday nights, I stopped at Target on my way home from work, only to be disappointed to find no packs of 2012 Topps on their shelves. Yesterday, to my great delight, I found rack-packs, individual packs, blaster boxes and those hanger box thingers in the baseball card aisle. I gleefully paid for the first new cards of the year and I opened my first few packs in my car in the Target parking lot. 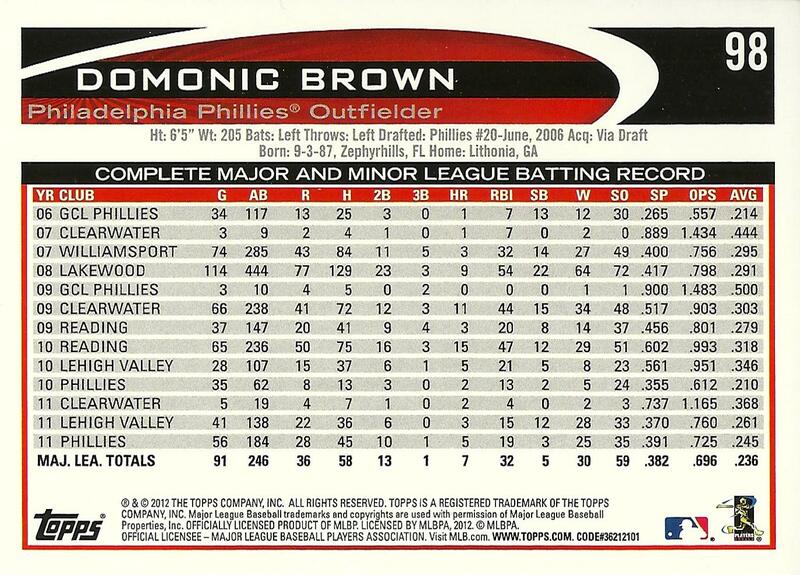 The first Phillie of 2012 was the card I've featured here - Domonic Brown. 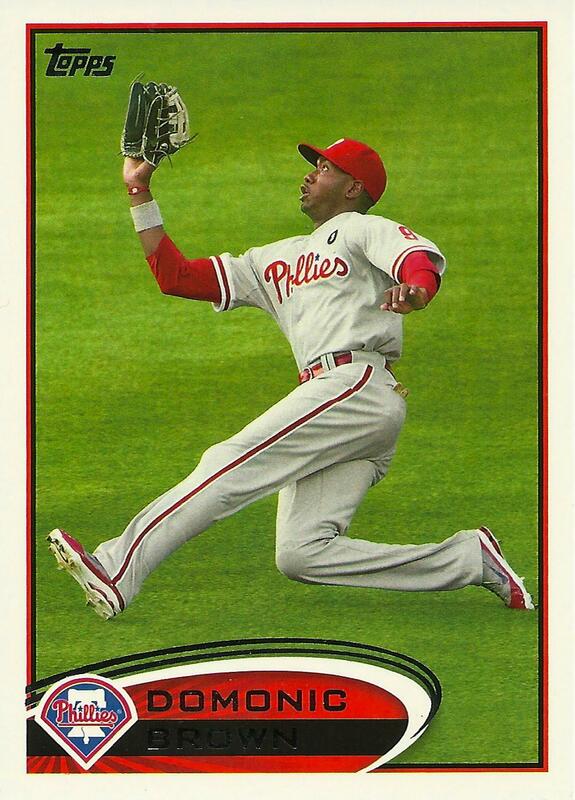 I had to wait until half-way through my third pack (and multiple Derek Jeter cards) before coming to a card with the Phillies logo on it. When I got home last night, Doug helped me open the rest of my packs and we added cards of Carlos Ruiz and Ryan Howard, among a few others, to the Phillies pile. I like the Topps set this year. I like them enough that I'm seriously considering hand-collating a Topps base set for the first time in probably over a decade. It's not that I'm in love with the set's design - it's more that I just miss the fun of putting a set together. It seems as if Topps is getting more ambitious with its photography. This Brown card is a good example of the type of game-play action shots throughout the first series. There are also a lot of celebratory shots featuring walk-off-win home plate gatherings or group hug shots. The backs are very plain this year, which isn't necessarily a bad thing. One of the first things I noticed (other than the lack of a player photo on the backs of the cards) is the use of all capital letters for the yearly team listing. I don't know if Topps has ever presented the team listing in the past this way, so it really jumped out at me. The active leaders cards are kind of random, but I like the concept. I just wish Topps had decided to group these cards together in the set. I got the Reggie Jackson Commemorative Retired Number Patch Card (#RN-RJ) in my blaster. Send me an e-mail if you're interested in setting up a trade for this card. I'm looking for the Mike Schmidt patch card from the same set. I have a suspicion that a lot of collectors will be putting together the 50-card 1987 Topps Minis insert set. Here are the cards I have up for trade from this set: 1 Braun, 4 Young, 17 Kimbrel, 44 Tulowitzki, 47 Castro and 50 Granderson. My packs yielded no squirrel cards. I bought a couple blaster packs at Target and got just two Phillies cards. 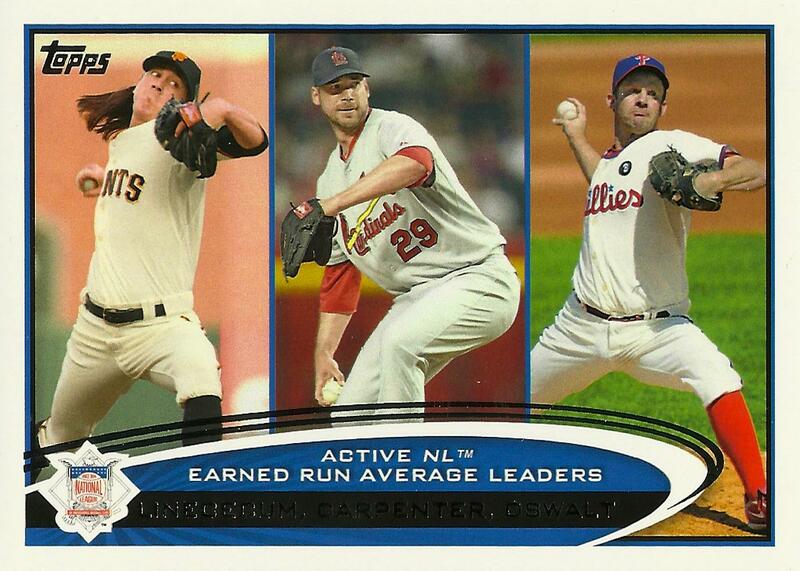 I noticed what you did about the leaders cards -- I too wished that Topps had grouped them together. I hope to post briefly about the cards later today as well.